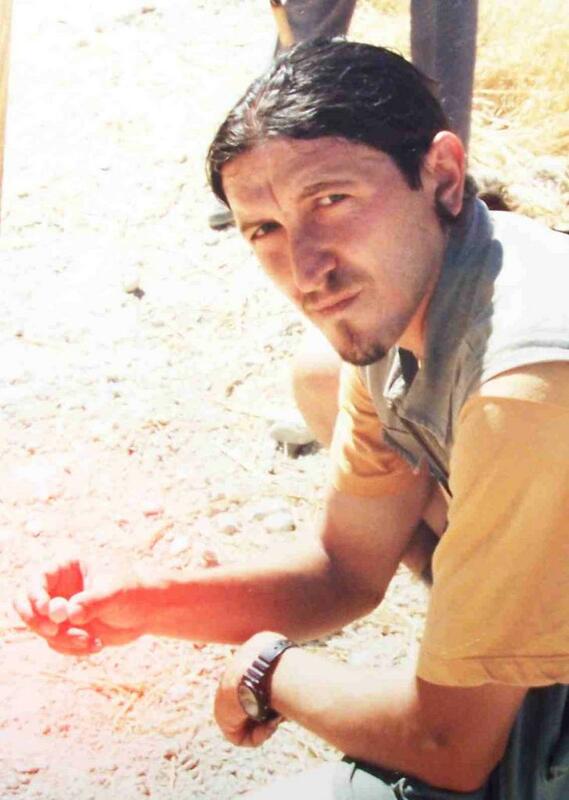 José Antonio Caravaca belongs to the last batch of researchers, writers and reporters focused on the world of the para that emerged in the early nineties in Spain. He has published over 500 research articles on UFOs, cryptozoology, archeology and other issues related to the heterodox. José has graciously allowed an English translation of his article to be shared here. While the article is well written and insightful, some of the language suffers from the mostly mechanical translation, particularly in the quotations. His article is an excellent overview of the incident as reported in UFO literature (which has some facts in dispute). José does note some of the controversial elements of the case, and also examines some possibilities as to the source of the UFO. Best of all, he remembers that whatever the cause, this was an event that happened to real people. His article treats them as such, and not just pieces of evidence. Sometimes people who have reported UFO sightings have suffered in their own flesh the consequences of dealing with this enigmatic phenomenon. And, sometimes, the physical scars suffered by the witnesses after an interaction with unidentified object or their crews, have profoundly influenced their lives. Probably one of the world's best documented incidents of alleged injuries caused by a UFO, is the one by two women and a child in the United States. The incident occurred on December 29, 1980, when Betty Cash (51 years), Vickie Landrum (57 years) and young Colby Landrum (7 years), had a close encounter with a strange aircraft that would change their lives completely. That night, about 21:00, traveling on a lonely road (FM 1485) near Huffman, Texas, when they spotted a huge bright UFO hovering above the trees. According Betty it was "diamond-shaped and as big as a water tower" estimating the size as 7.5 meters high by 3.5 meters wide, although her companion stated the object would was at least 15 meters for 7 , 5 meters wide. Had a "dull metallic gray" color, as Vickie, with blue lights in the center and issued a"powerful sound like a flamethrower" interspersed with intermittent "beeping" sounds. The force of the flames and the extraordinary luminosity detached from the object made ​​it almost impossible to distinguish clearly the details of the apparatus. The witnesses also distinguished a smell "like lighter fluid." Betty Cash and Landrum Vickie were protagonists of one of the most controversial incidents in the United States. The UFO but was about 40 meters away from the witnesses and had greatly raised the temperature inside the vehicle. Ms. Cash stopped the car when Vickie screamed that if they got close to it they would burn up. Betty later ensure that: "I felt I was burning inside. The light blinded me so much that I could not see to back up the car and was afraid to move forward, closer to the object. " 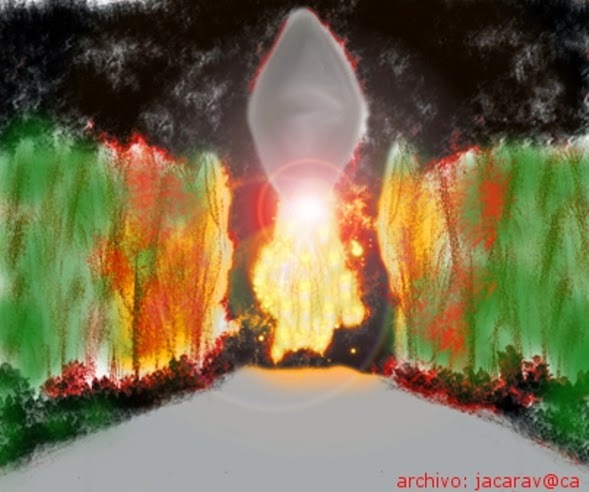 At that time, the object had approached the witnesses standing on the tarmac about 7 feet tall and obstructing the passage of the road with its powerful flares. At first, Ms. Landrum, who held strong Christian convictions, thought that light was due to the "return of Jesus Christ to earth" in fact told her grandson: "That's Jesus. He will not hurt us. " The bright image stood out in the dark night sky, completely and frightening baffling both women. 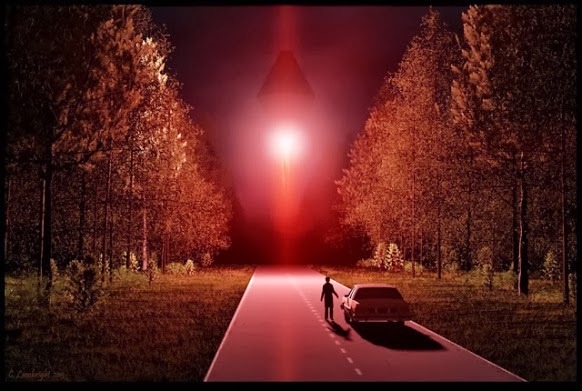 At that time, Vickie looked from the car to see the whole area around the UFO was heavily lit "as if the whole forest is on fire". From outside the car was an intense wave of heat released by the object, although the temperature in the area was of 4.5 degrees. In an interview with the USAF Captains, Terry Davis and John Camp, in August 1981, at Bergstrom Air Force Base, Betty said: "I walked to the front of the car and the light was very bright, well .. . the heat was so intense, I did not know whether to run, back to the car ... and I was there for a few minutes. Not long because it was so hot and the light was so bright "that" burned "eyes". 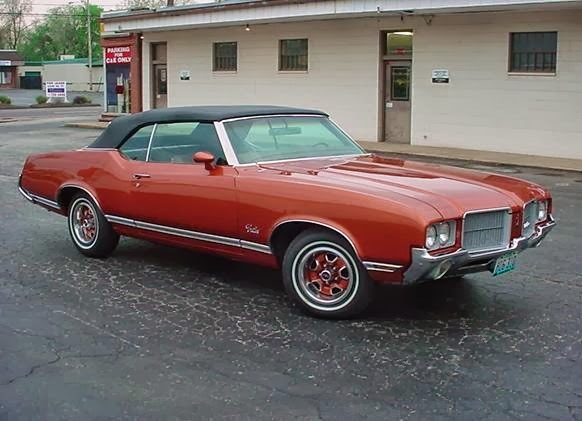 Vehicle similar to that of the witnesses. From the bottom of the "diamond of fire" emanated, at regular intervals, an intense flow of reddish-orange colored flares. Such was the magnitude of the heat that came from the object when Betty back to her car could barely touch the door handle and had to use her coat pocket as to reenter the vehicle, plus fingerprints were impressed in the witnesses' dashboard due to the high temperature and also in the interior of the vehicle which caused some plastic parts to be almost melted.Vickie also left the car but returned to answer the cries of her grandson, and was only outside for 2 minutes. When the UFO finally the began to move, after being stationary 10 minutes, the women continued their drive into the distance watching the flight of the "diamond". The device emitted powerful flares at its bottom. Its brightness was such that could not see with the object definition. The light of the alleged UFO burning eyes. Image Chris Lambright. 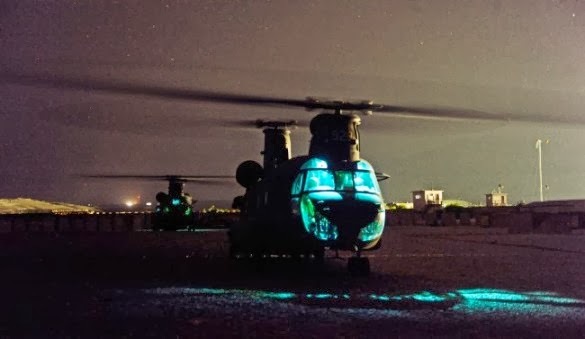 But the most disconcerting experience is that, at the time, the witnesses said around 23 helicopters burst on the scene, some of them later identified as the CH-47 Chinook, used by both the U.S. Army and the Marine Corps. Ms Cash told investigators that the helicopter seemed to be trying to surround the "fire diamond". The object and the helicopters flew away into the night. Researcher John Schuessler, author of "The Cash-Landrum UFO Incident" (1998) failed to find more witnesses to the incredible incident. Jerry MacDonald, an oil worker witnessed that night from the backyard of his home, "a sort of triangular or diamond (...) with two parallel torches giving off blue flames on its back" while passing over his house. Schuessler also located a Dayton police officer, L.L. Walker who had seen "helicopters were flying in formation of three, with spotlights illuminating the ground as if looking for something. A second group followed them about 5 miles." Belle Magee employee of a bakery recalls that night, about 13 miles from Dayton seeing a bright light in the sky flying towards New Caney. John Schuessler said the pavement where the floating object had been was melted, but could not detect radioactivity in the area or in the car of the witnesses. However, some researchers indicated that the high-energy ionizing radiation can cause damage to human beings and not be detectable in the surrounding environment. Later, when the Army conducted an official investigation, through the "Inspector General of the Army," Lt. Col. George Sarran who interviewed Betty Cash, Vickie Landrum and the police officer, concluded in his report that the witnesses " are credible ... The policeman and his wife are also credible witnesses. There was no perception that the witnesses were trying to exaggerate the truth. All those interviewed were extremely cooperative and willing to help in any way. In the course of the investigation, the investigating officer tried to focus on the name of any entity or organization that may have had helicopters flying that evening. There was not any evidence that would indicate that helicopters of the Army, National Guard or Army Reserve they were involved." After this experience , the women suffered terrible physical consequences. That night, Betty Cash suffered vomiting, and found her skin was completely red, especially the neck, face and scalp were also dotted with blisters. The burns were similar to those suffered by long exposure to the sun without any protection, and the first symptoms appeared just 30 minutes after witnessing this strange flying object. The blisters were the size of a golf ball on the neck and face, and even covered her eyelid. Some sections of the press were quick to qualify the incident as an "attack" on UFO witnesses. The next day Betty was so weak she could not move from the bed. When Betty was attended by doctors, she concealed, for fear of ridicule, her extraordinary sighting, making it difficult for physicians identify and target the source of their severe discomfort. But in the end they concluded that Ms. Cash was affected by acute radiation, which forced her to be hospitalized for several weeks. In addition, to check the physical impact of the event on Betty, it should be noted that days after the incident, the woman lost nearly half of the hair of the head and had different skin rashes, some the size of a large coin, which left permanent scars. In turn, Vickie and Colby had various skin problems and skin seemed defenseless against infections following the sighting. But perhaps the most serious injury suffered by Vickie has been to her eyes, as her vision was severely affected with the passage of time, in fact his eyes were watery and irritated for 3 months. Her eyelids were infected very quickly and have never been recovered. Her grandson has also had problems but at a lower level. Remember that Betty was expose for about 10 minutes to the object outside the vehicle, Vickie 2 minutes and Colby did not spend any time out of the car, so the impact on witnesses varied, obviously, depending on the time of direct exposure to the UFO. 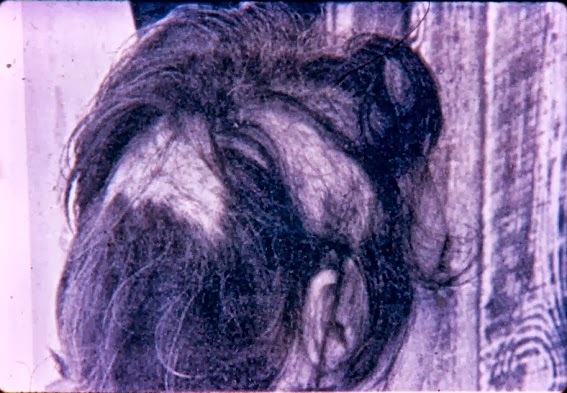 As an interesting detail doctors said that a few weeks after the event, Vickie had lost about 30% of her hair and had large bald patches on the head. When the hair grew back it was a different texture, finer than the original. Her grandson Colby lost only a small portion of hair from the crown. 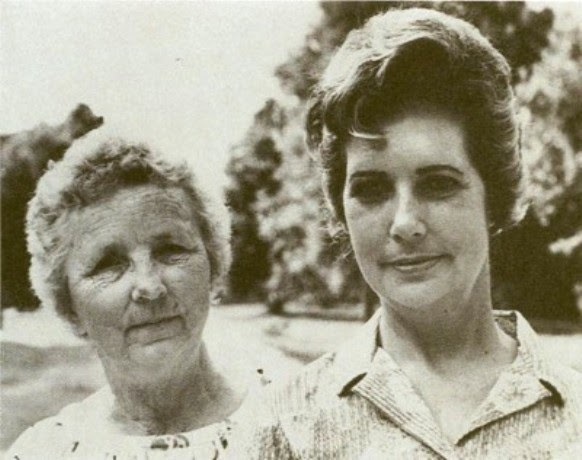 In August 1981, Vickie Landrum, due to damage caused by different exposure to disturbing UFO, though I went from 62 kilograms to 50 kilograms in 8 months (12 pounds lost). Ms. Cash shows reporters hair loss he suffered a few days of the incident. The witnesses suffered various physical injuries after thier unusaul his close encounterl. Ms. Landrum suffered strange "burns" that were visible for a long time. Doctors who treated the witnesses also came to the disturbing conclusion that on the night of the sighting they were exposed to some form of radiation that caused them many evils like, "Burns, eye damage, loss of hair, skin ulcers, diarrhea and vomiting." In September 1991, the personal physician of Mrs. Cash, Dr. Brian McClelland, told the Houston Post that his condition was "a textbook case" of radiation poisoning to be comparable to a "5 or 8 miles from the epicenter of Hiroshima". A radiologist wrote in a report to MUFON (Mutual UFO Network):" We have strong evidence that these patients have suffered secondary damage produced by ionizing radiation is also possible that there was an infrared or ultraviolet component "As.. experts exposure to high doses of ionizing radiation can cause "skin burns, hair loss, nausea, sickness and even death. The effects depend on the amount of ionizing radiation received and the duration of irradiation, and personal factors such as gender or age. " Although other specialists like Brad Sparks, indicates that despite the similarity of symptoms, the witnesses could not be exposed to ionizing radiation or they would have died within a few days after the first signs appeared . However, Sparks notes that, in his opinion, it is likely that they were exposed to some kind of chemical contamination, perhaps a spray. The most affected was precisely Betty Cash, who spent more time watching UFO, about 10 minutes at a distance of 40 meters. Her health weakened dramatically since that day, to the point of having a breast cancer. Throughout the years it underwent several serious hospitalizations, until November 1998, Ms. Cash suffered a stroke, from which she did not fully recover, and passed away at age 69 on 29 December 1998, exactly 18 years after her fateful encounter. Researcher John Schuessler with witnesses at the scene of the sighting. Dr. Bryan McClelland was convinced that women had radiation contamination at levels 2/3 gray (Gy), given a level of more than 5 Gy leads to death in about two weeks. The Office of Radiation Control Texas Department of Health began an investigation that was never made ​​public. 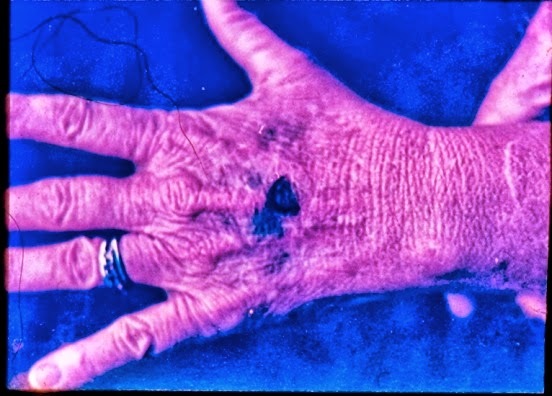 As evidence that the health problems were in clear correspondence with the object, when Ms. Landrum exited the vehicle, she laid her hand on the roof, and developed a strange disease to only 4 fingertips. Specifically, Dr. Niemtzow, discovered that the nails of these fingers had developed "dead tissue lines" similar to cancer patients receiving chemotherapy. The funny thing is that Dr. McClelland stated that an inside source informed that the UFO seen by women was an experimental aircraft called nuclear WASP II. Dr. Joseph Allen Hynek stated bluntly that "it was a real event, but whether it is a maneuver of the government or the appearance of a UFO," concluding "Something happened, that it is certain. These women didn't pull their hair out or blind themselves ". The fact that the UFO was escorted by military helicopters made ​​the witnesses look for explanations and responsibilities to the government of the United States to consider that it could be some kind of experimental prototype that got out of hand. In fact, in the interview with the officers of the USAF, Ms. Cash was emphatic in stating that the helicopters were the hallmarks of the USAF. Therefore, in August 1986, Ms. Cash and Ms. Landrum filed a civil suit against the U.S. government claiming $ 20 million for damages for what they considered were caused by Army property. The Ross Sterling Court judge dismissed the case after the Army, Navy, USAF and NASA inform that did not have any kind of device as described by the witnesses. Schuessler believes there is a deliberate campaign to hide information when he says that "the doctors did not want to say too much for fear of inflicting the principle of patient confidentiality, but believed that the injuries were authentic. I also interviewed generals and congressmen, who gave me endless answers. Most of them contradictory or outright lies. All that made ​​me think I was at an important case because the upper echelons did everything he could to deny it. " The involvement of military helicopters suggested that the U.S. government was responsible for the event. The lawyer in charge of the case, Peter Gersten, mourning the death of one of his clients, Ms. Cash in 1998 said in a public notice: "In 1981 I represented three people in a lawsuit against the U.S. government by injuries caused by contact with an unusual aerial object. Betty Cash, Vickie Landrum and Colby Landrum are the only three people who have sued our government for injuries caused by a UFO. Betty Cash was a fighter and a hero. She fought the U.S. governmentand even in defeat, showed a spirit and tenacity which will now be his epitaph. We pay tribute to a very brave woman ... and a victim of this government's insensitivity to the rights of the person." According to some experts, the witnesses that night ran into a secret military aircraft lenticular form called LRV. The propulsion of the vehicle consisted of two nuclear rocket engines. The project was classified as secret since its inception in 1962 until December 28, 1999, when it was approved for declassification. However, the government continues to deny any link with this enigmatic and deadly incident. Nevertheless, over the years, speculation about the artifact that caused serious injury to the witnesses has not stopped growing. Participation or involvement of the U.S. military has made ​​many researchers speculate on the nature of the mysterious "diamond". A suspect. 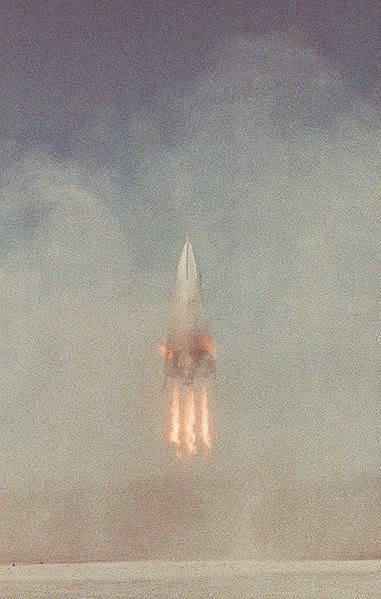 The Delta Clipper or DC-X was an experimental vehicle designed by McDonnell Douglas, and was able to take off and land vertically. Although the first official tests were performed in 1993, it is likely that early experiments were secret and many years ago. Perhaps it was either a secret prototype, or the flight test of a true UFO recovered by the military, and it mistakenly left the test range. The presence of a large number of helicopters suggests that it is a must have been a preplanned operation. However, researchers still argue that the witnesses actually observed a UFO and that follow-up by military helicopters were sent to intercept. The ufologist John Schuessler is convinced that "the case was genuine. Cash and Landrum saw a UFO (which may be in difficulty or not). The army deployed a fleet of helicopters to follow "However, Curtis Collins, a researcher specializing in the case, offered his view to the author of this report. "This is a fascinating case, but it's puzzles are many. There was no primary investigation by police or the Air Force, only by UFO investigators, led by John F. Schuessler. Studying this case, it become clear that almost all our knowledge is imperfect, based on Schuessler's highly selective reporting. The core story of the event is fairly close to what the witnesses reported, but the analysis of alleged injuries, physical trace evidence, secondary witnesses testimony all have serious evidential problems. Schuessler and his team were knowledgeable aerospace engineers, but unprofessional as investigators. Due to their preconceptions as proponents of extraterrestrial space travel, they entered the case seeking to fit events into their UFO paradigm. Another bias enters the case, that of the witnesses themselves. They refused to consider any answer besides the military test theory. The case is worthy of study, but the first big step is to recognize that it has become a legend. To get to the truth of it, we have to peel away the layers of myth." No reproduction of the material without express permission. Property of Jose Antonio Caravaca.